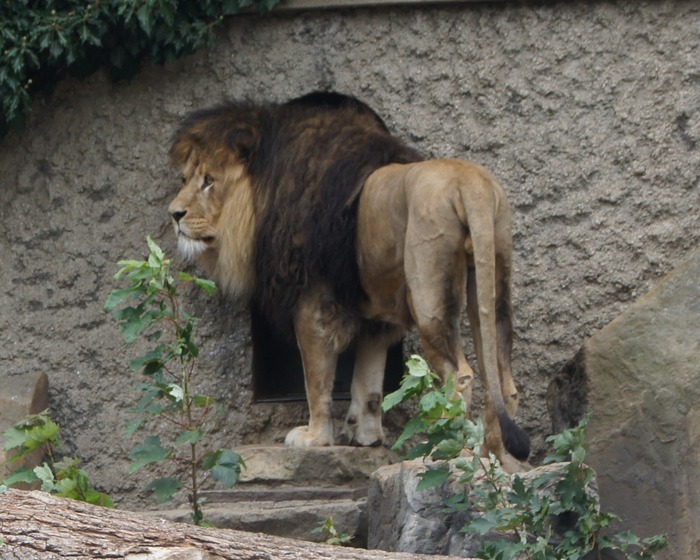 For my birthday this year I decided to take the new camera to the Artis zoo. The first thing we found was a watusi - a breed of cattle, probably descended from Indian cattle who migrated to Africa, which uses its enormous horns to cool itself in the hot climates where it lives. 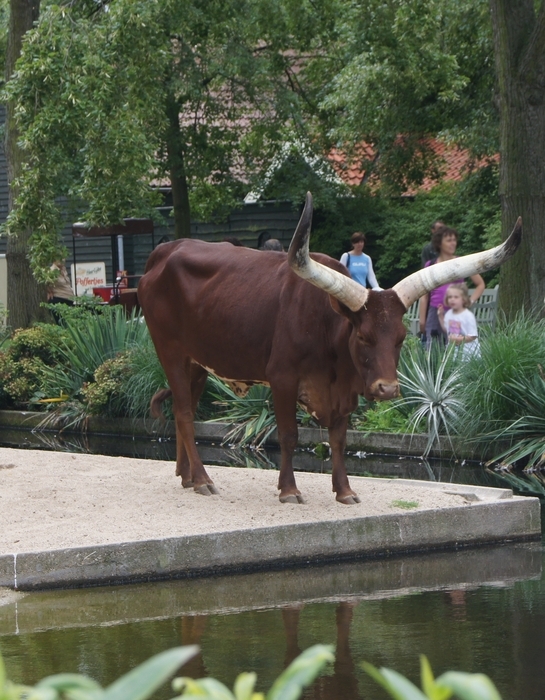 Several cultures in Africa have taken to herding these cattle, and, of course, favor the ones with the largest horns. 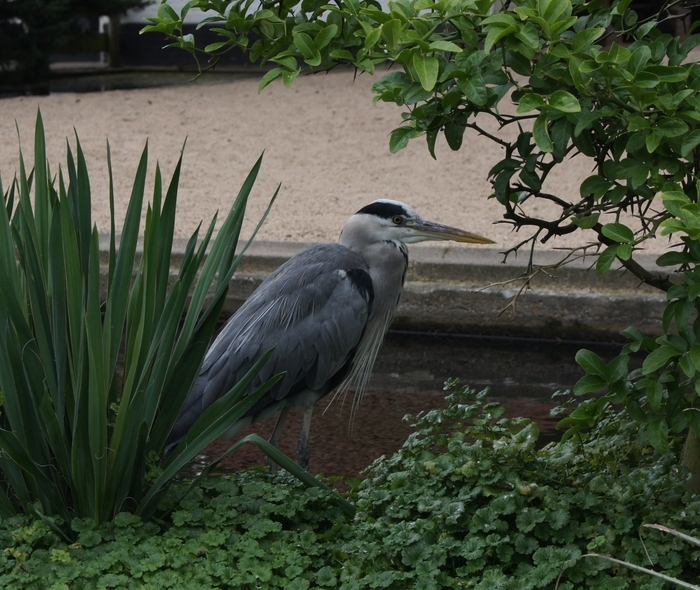 The next thing we found was another visitor to the park - one of the local grey herons. It was creeping along through the greenery and seemed to think it was doing a good job of hiding itself - at least good enough to let me get close with the camera. 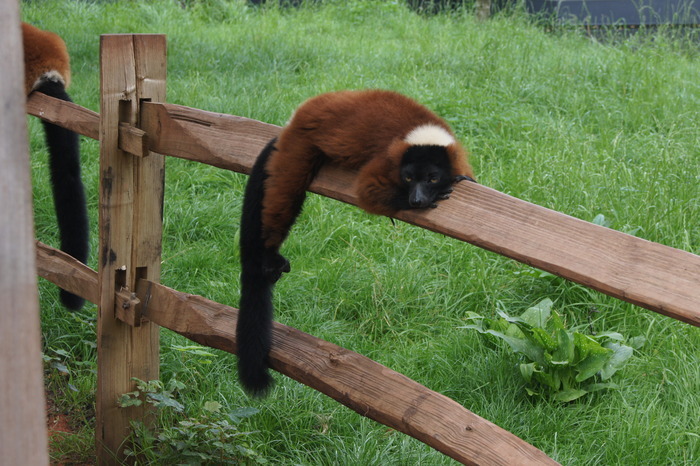 It was sunbathing hour on Lemur Island, and the red ruffed lemurs were catching the rays. There was no fence between us and this guy (I assume guy, even though you have a clear view I'm not actually sure), although the lemurs seemed inclined to move if the two-leggers got too close. This one is on the other side of the chain, and if possible more laid back than the other. 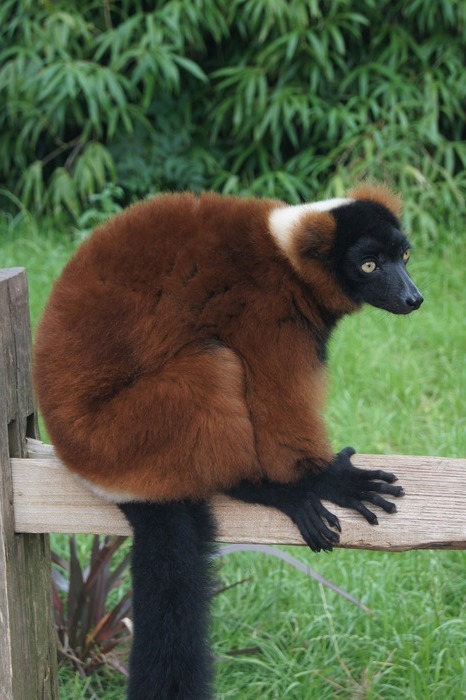 Red ruffed lemurs are one of the largest remaining lemurs on Madagascar. I say remaining because 17 species, including the largest lemurs weighing up to 200kg, went extinct with the arrival of humans on the island about 2000 years ago. Madagascar is unique because primates fill many of the ecologic niches on the island, including 50 or so species of lemur. The tiny mouse lemur fills the role of rodents, weighing about 40g (the size of a small mouse) and eating seeds, insects, and flower nectar. 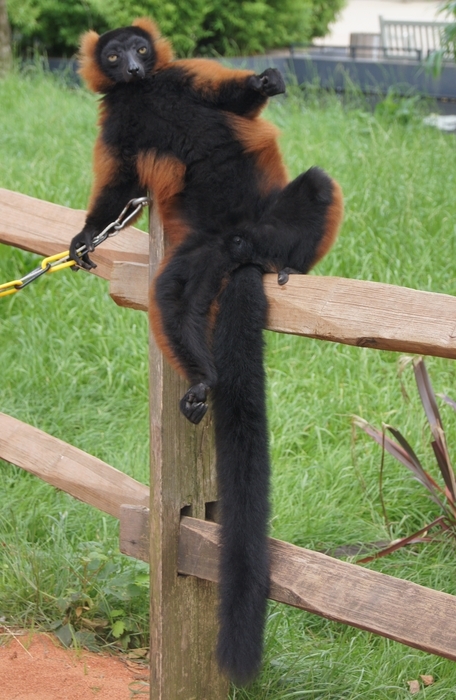 Meanwhile, the Greater Bamboo Lemur behaves much like a panda, eating almost exclusively bamboo. The recognizable ringtail lemur lives in social groups of 30 or so, led by a dominant female. Living lemur species range from threatened to nearly extinct, as people have continued to convert forests into farmland and firewood. Madagascar is a poor country, and much of its income depends on farming vanilla, sugar, and other products which are farmed and exported. 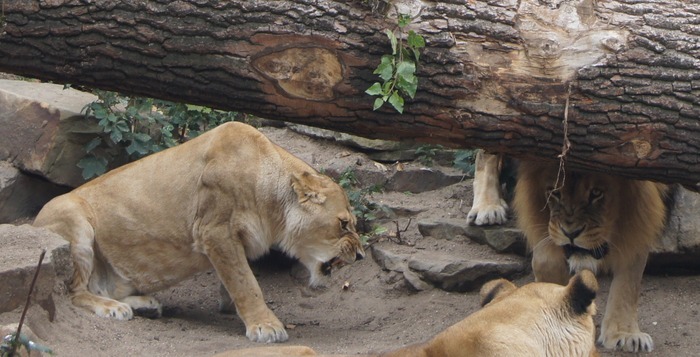 The lions were having a domestic dispute when we arrived. It seemed that the male either wanted to cuddle with this lioness, or wanted her spot, it's not really clear which. Either way she gave him a pretty clear signal to mind his own business. The clicking and chittering sounds of my camera have caught the black panther's attention. 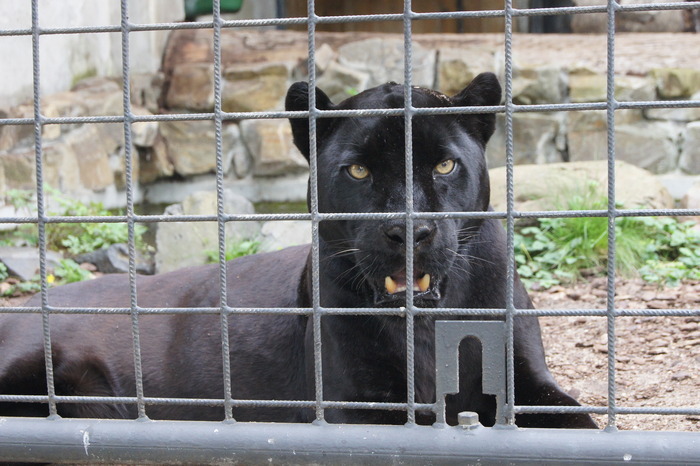 Black panthers are not a species, but rather a term used to describe any of a number of black varients of big cats. The most common are black leopards, from Africa and Asia, but black jaguars are also known from the Americas. This one is a jaguar, although it would be hard to tell without reading the sign. In the US, black bobcats have also been confirmed, and although there are rumors of black cougars, there is as of yet no evidence of them. The amur leopard, from Siberia and Korea. 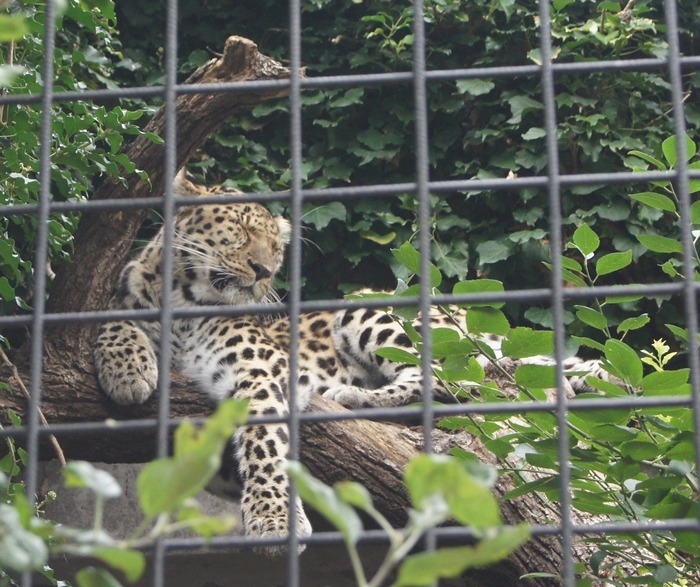 Only about 35 amur leopards remain in the wild, and about 300 in zoos. This is not a cat, although it looks like one, hunts like one, and even has retractable claws and pupils that form vertical slits when they contract. 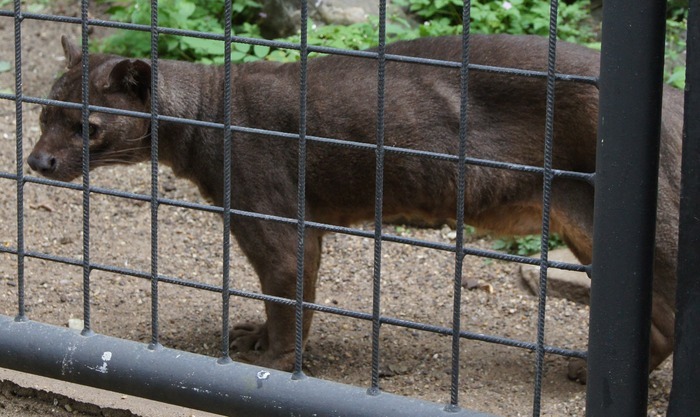 It is a fossa, a carnivore unique to Madagascar. It is thought to descend from a common ancestor which also gave rise to both cats and the mongoose and civet families. Fossas also share traits with these two families. Another park visitor. This bird was sitting very quietly in the tree. 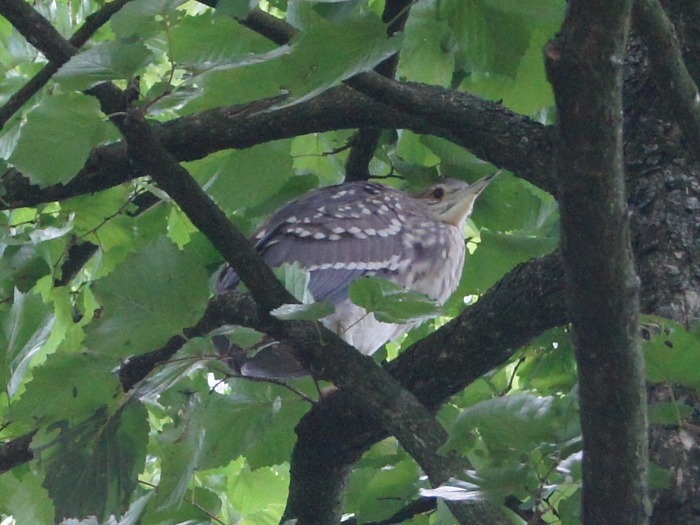 It is about the size of a wood pigeon or a small chicken. It looks a bit like some of the shore birds, although those are normally found at the shore and not in trees... but hanging out at the zoo is a pretty good deal for birds, and may yeild some unusual behavior. 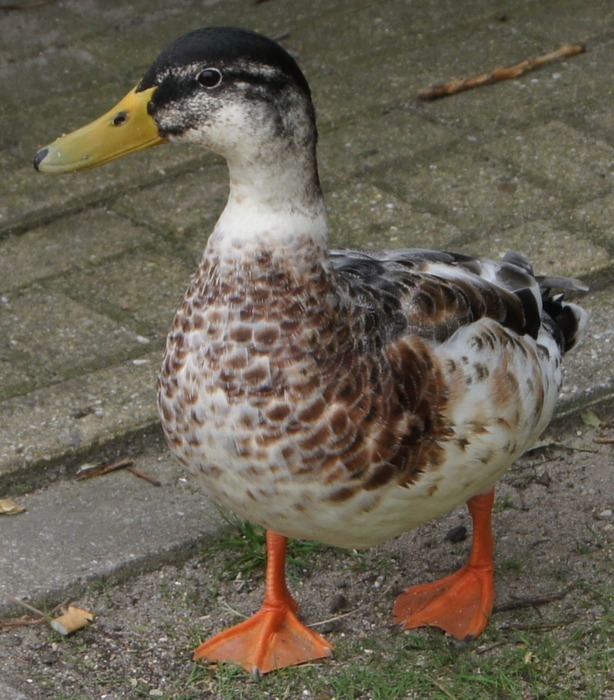 This is probably a cross between a mallard and a domestic duck, possibly with some black duck in the mix. It is certainly begging for french fries. Cuddling scimitar-horned oryx. I suppose they cuddle carefully. If you look carefully you can find the baby something in the foreground. 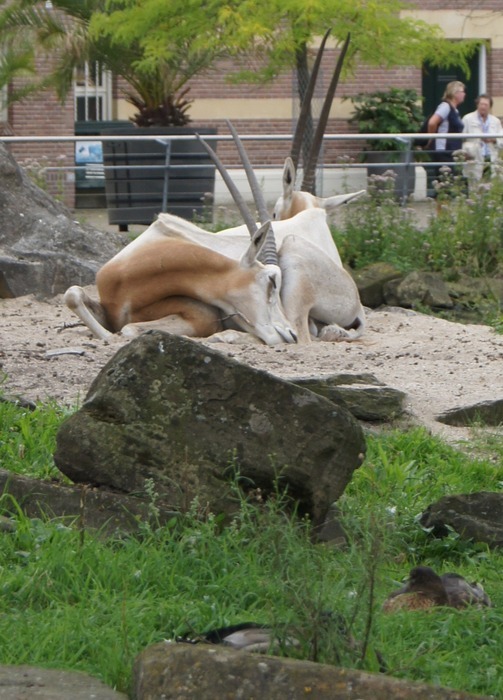 It is not the same species as the adults, although it might be a different kind of oryx. 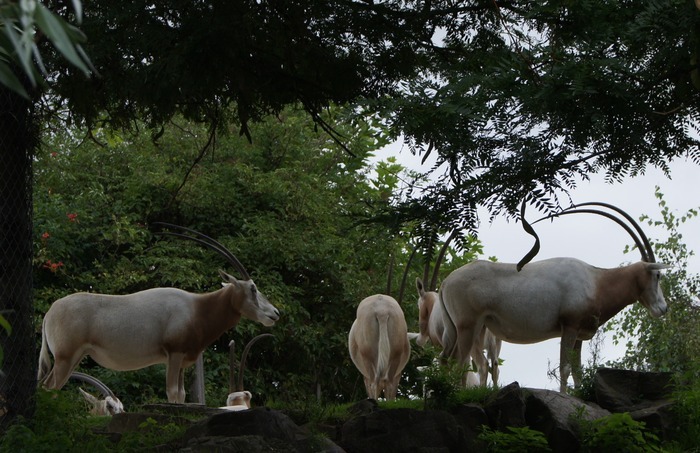 A herd of the scimitar-horned oryx on a hilltop. There is a story, possibly apocryphal, of the distinguished British biologist, J. B. S. Haldane, who found himself in the company of a group of theologians. 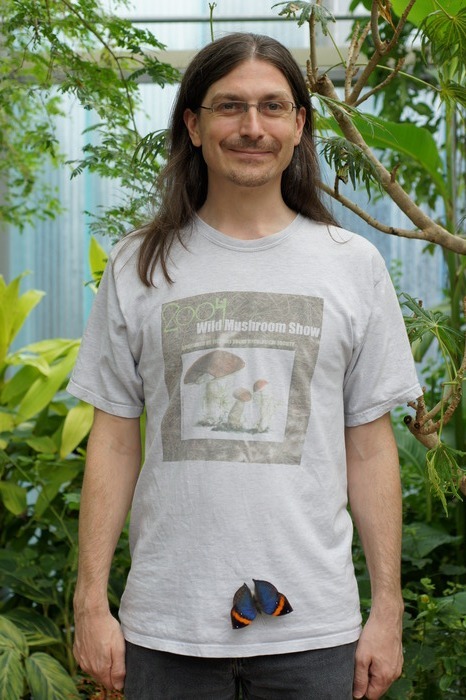 On being asked what one could conclude as to the nature of the Creator from a study of his creation, Haldane is said to have answered, An inordinate fondness for beetles. Homage to Santa Rosalia or Why Are There So Many Kinds of Animals? What happens when you cross The Secret Garden and Little Shop of Horrors : the Carnivorous Garden. 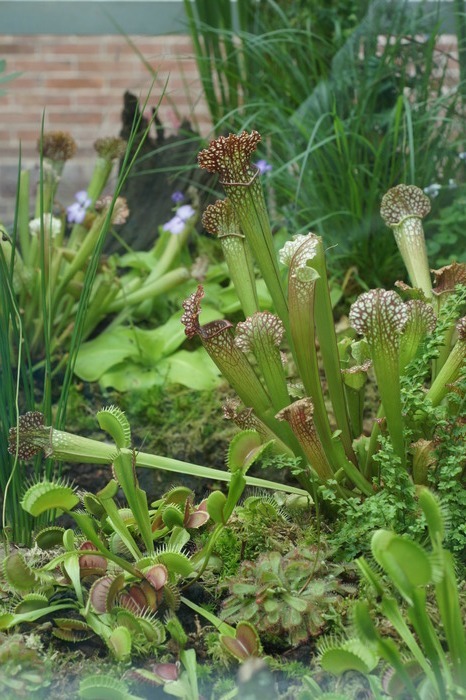 The three major groups of carnivorous plants are here: pitcher plants, sundews, and venus flytraps. 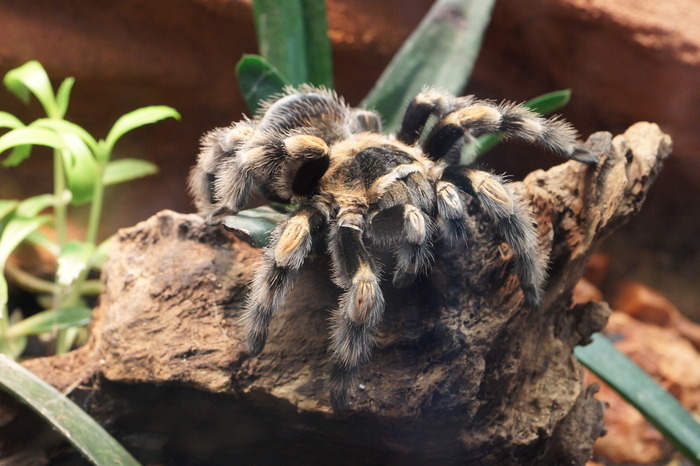 Red-kneed tarantula, a native of Mexico. 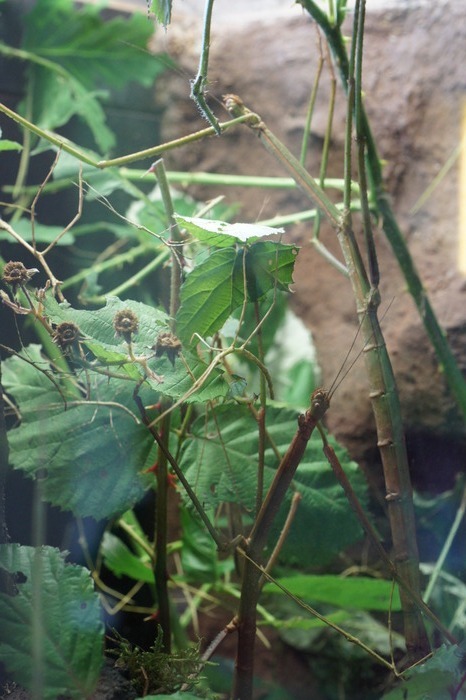 Another in the ever-popular series of crypsis photos: spot the walking sticks (hint: there are at least 5 in this photo, the front half of a 6th, and a couple others which are not quite in focus). This photo is dedicated to Kerry. He knows why. 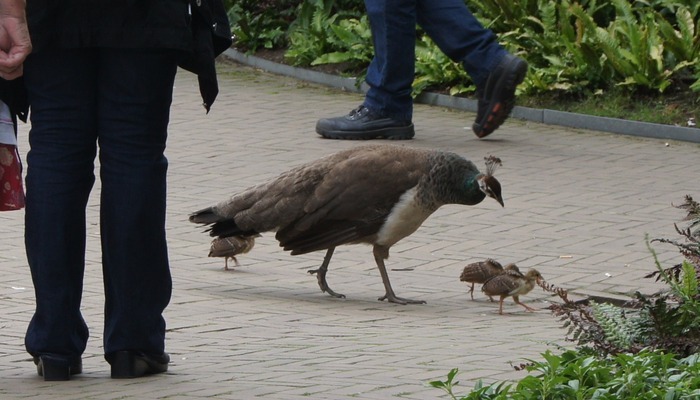 The peacock family out for a stroll. 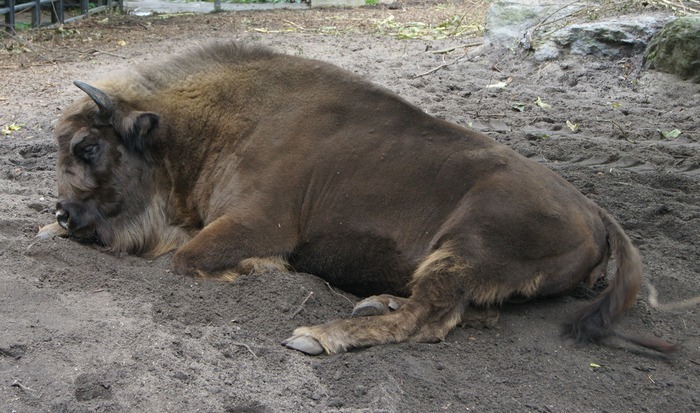 I had no idea there was such a thing as the European bison, until I saw this one. There almost wasn't such a thing. While wild bison once occupied all of Europe and western Asia, their population retracted as the human population grew. The last few wild bison fell victim to World War I, when they were killed and eaten by soldiers encamped in Poland. However, about 50 remained in zoos throughout the world, and a German biologist with an eye for conservation began a careful breeding program. In 1951 the first herd was re-released into the wild, and now there are about 3000 individuals in zoos and in forest preserves throughout Europe. Magellanic penguin, with the moxxy turned up to 10. 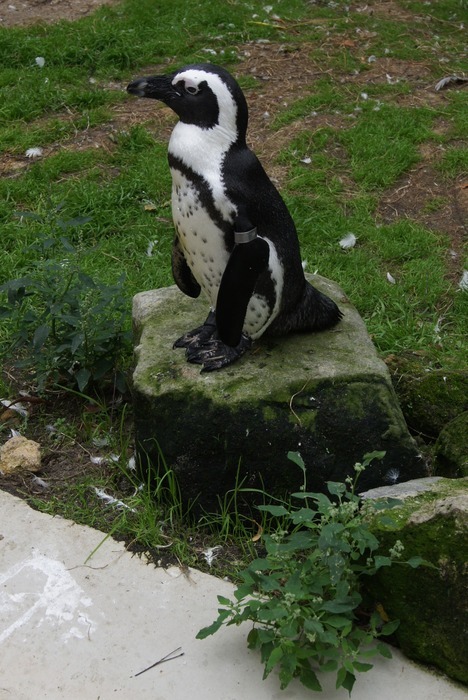 The African penguin. 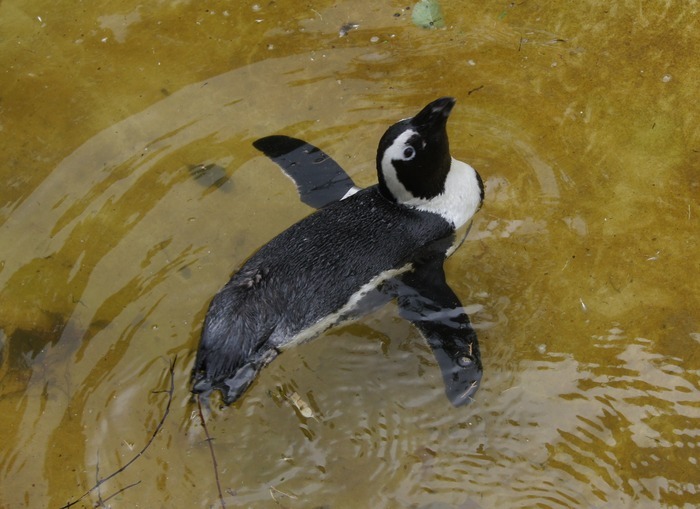 As you might guess by the name, this is the only penguin species in Africa. They are normally found on the islands around Africa's southern coast, although recently mainland colonies have been established. This is probably made possible by human elimination of large land predators, which would have made the islands a safer bet until very recently. There are 17 species of penguin, and this appears to be none of them. It is colored most like a little blue penguin, but lacks the white border around its wing. It has a bit of a white spot on its head, but not the broad white band of the gentoo penguin (I also recall that it was a bit smaller than the African penguins). It has a dark beak and mottled pink and gray feet. It is possible that it is a juvenile, or a hybrid. 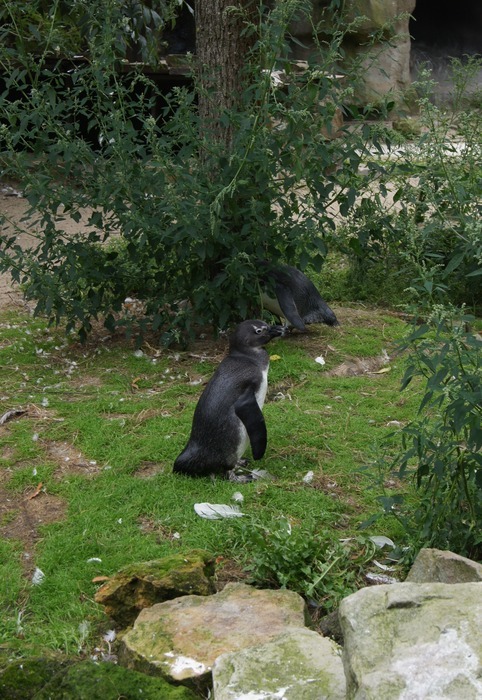 Certainly in this enclosure, a lonely penguin could find a way to hybridize. 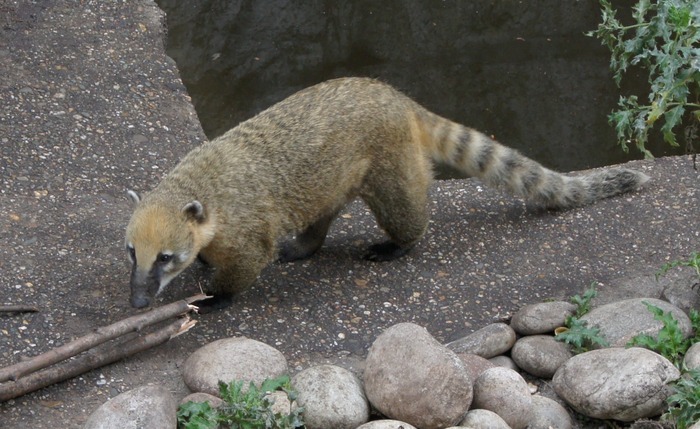 South American coati. These are fairly popular as exotic pets. In the wild, females live in bands of 15-30, but males are solitary. 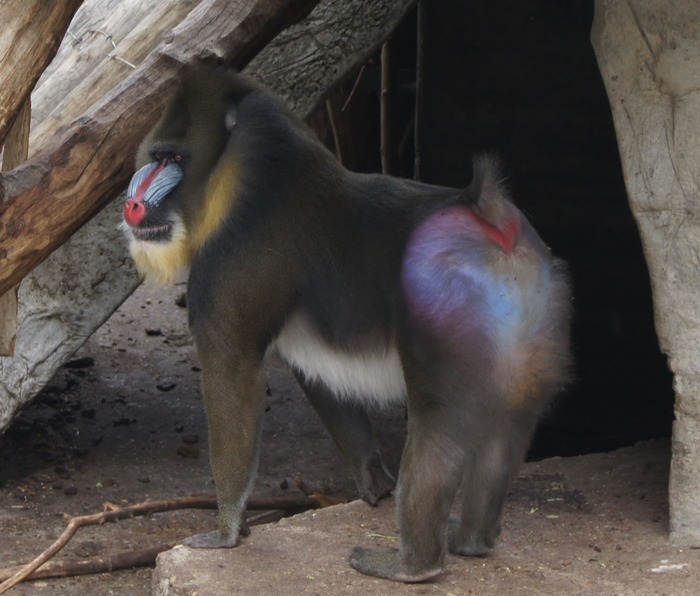 The adult male mandrill shows his iridescent bum. 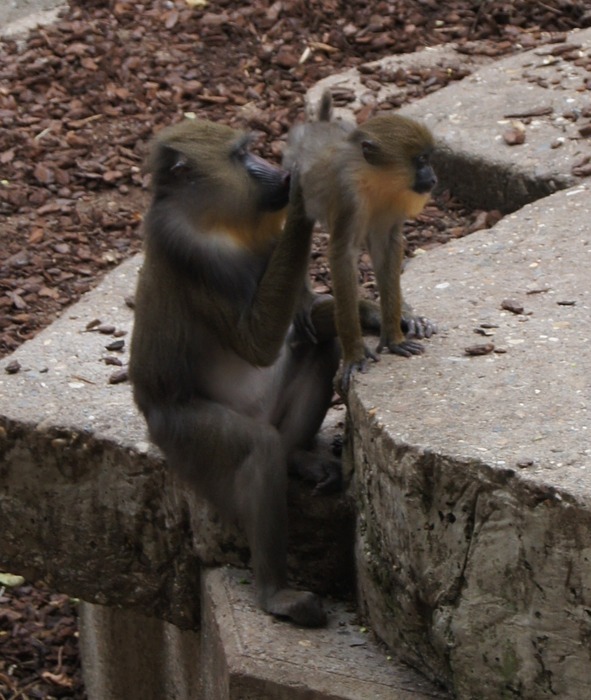 Mandrills are a type of monkey from western Africa. They live in dense jungle, and it is thought that the bright colors help keep the troop together. A troop consists of a single adult male, around a dozen females, and juveniles. Most adult males live alone, although large groups of up to 1300 individuals of both genders have been seen traveling together. Mandrills also have long, sharp canine teeth, although like humans, showing their teeth is usually a smile and not a snarl. The females are about half the size of the males. Mom is grooming her baby. 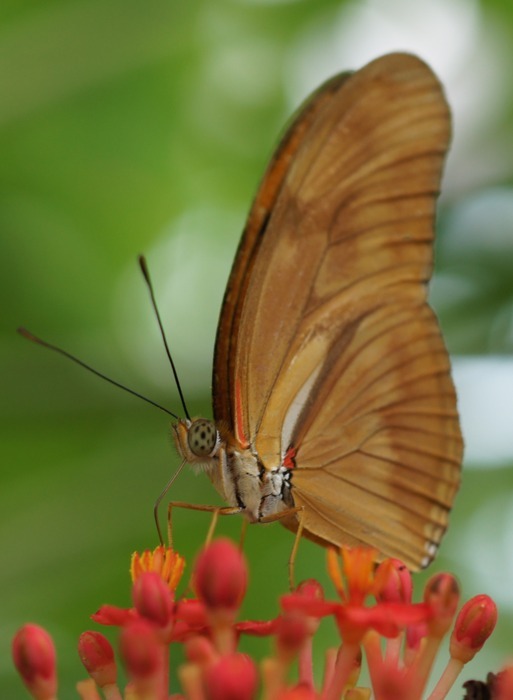 Since I am fond of macro photography, one of my favorite spots in the zoo is the butterfly garden. 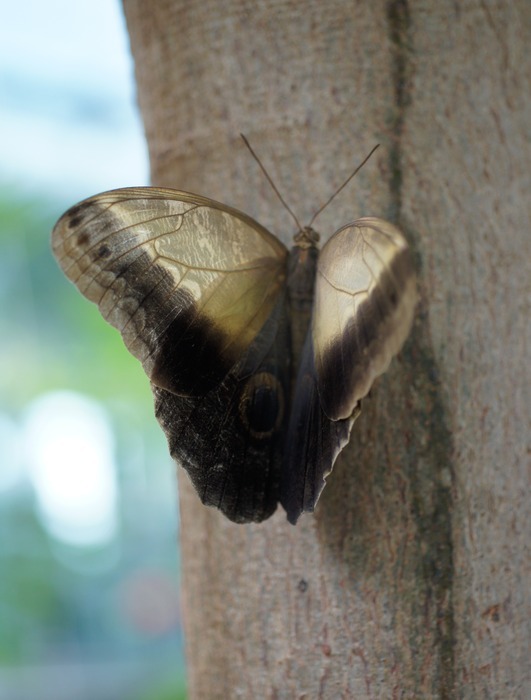 Here's the Blue Morpho in its typical pose: wings folded so you can't see the blue. 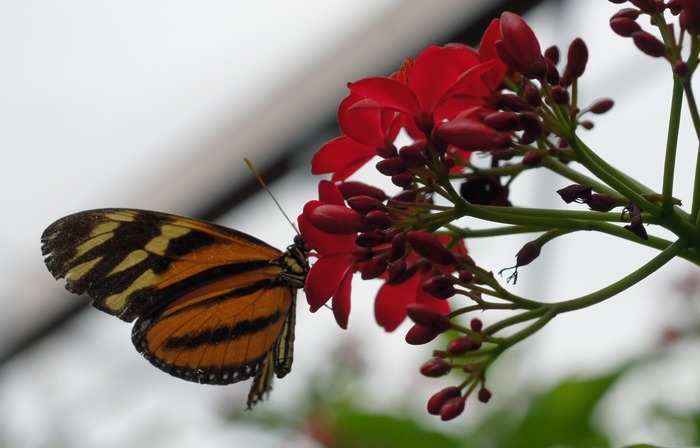 A Heliconius or longwing, possibly H. wallacei or H. doris. Both are black with light bars on the forewings and red shoulders. 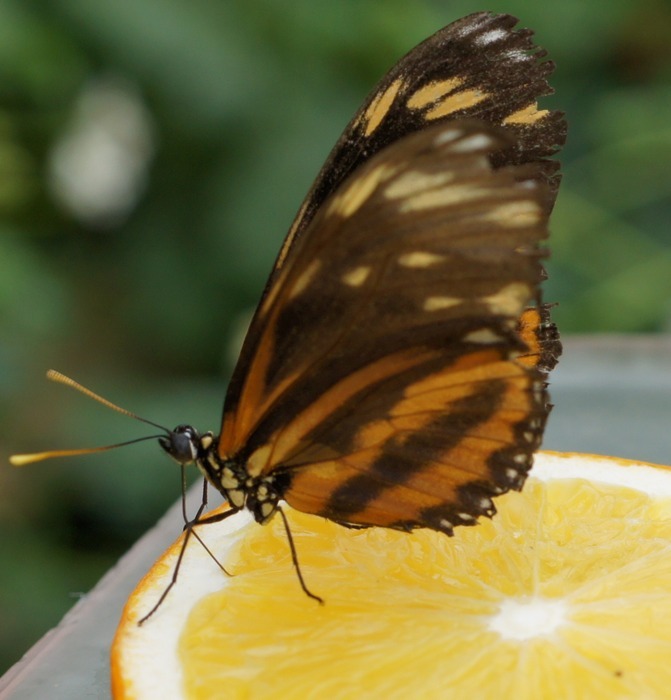 A more typical Heliconius, some of which have orange coloring to warn that they taste bad (a form of honest advertising ), and others of which mimic the orange color but not the foul taste. 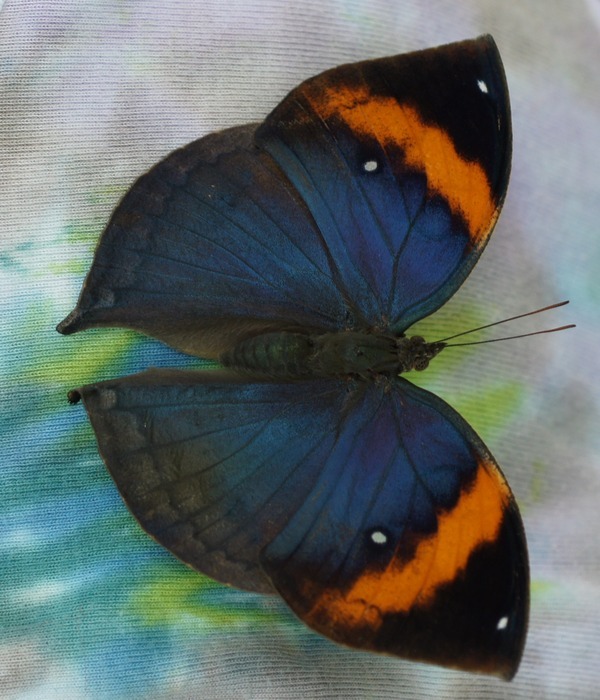 Biblis hyperia, the red rim butterfly, from Central America. Caligo eurilochus, or forest giant owl butterfly. 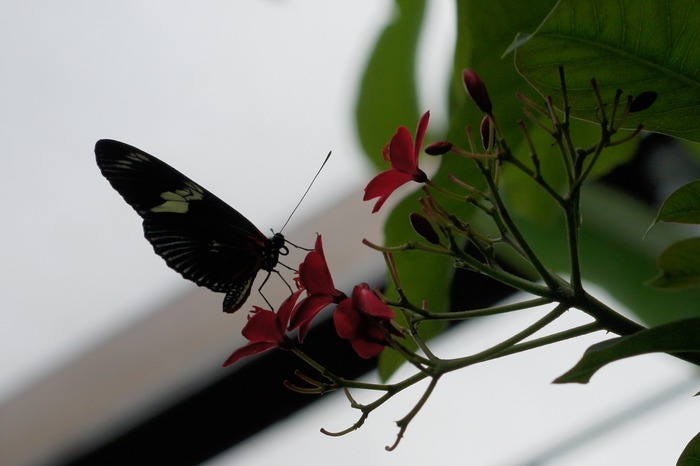 Heliconius species, possibly Heliconius telesiphe or Heliconius erato. 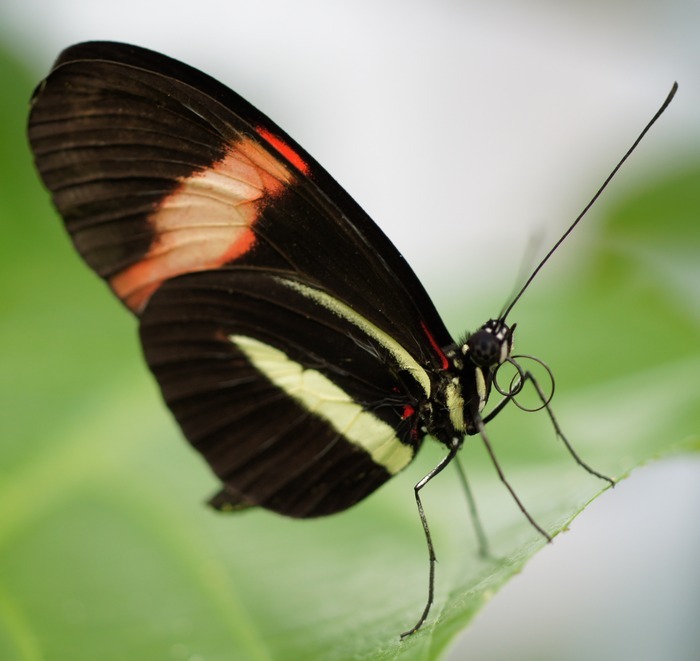 The species names of most of the Heliconius are derived from Greek mythology. 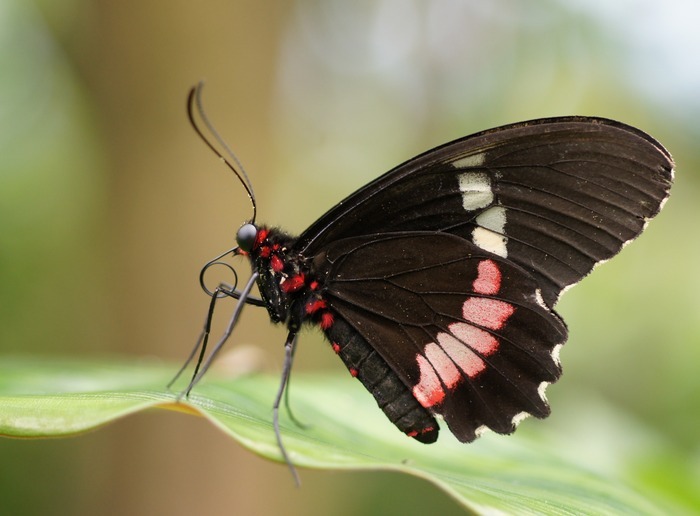 The genus name, Heliconius, meaning dwellers of Mount Helicon. Mount Helicon was regarded in ancient Greece as the source of all poetry and inspiration. This species, Erato, is the name of one of the nine muses - in her case, the muse of love poems. 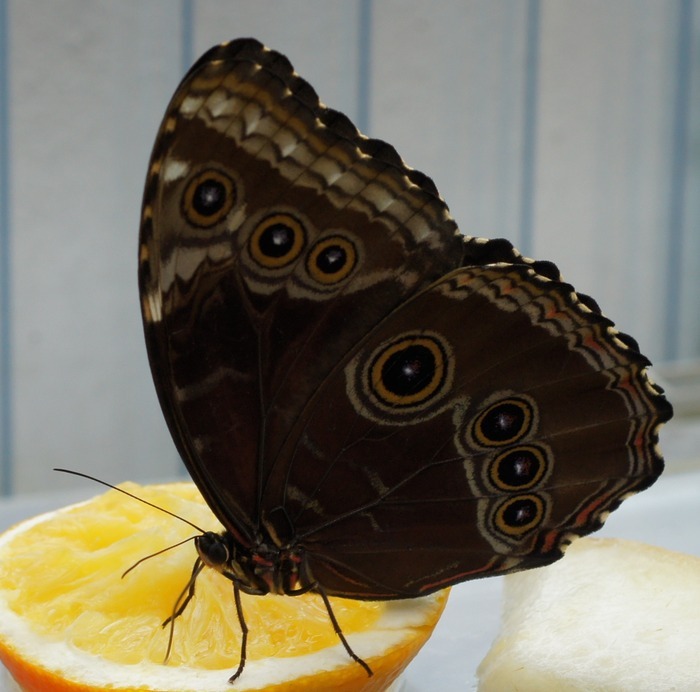 A rather tattered and typically orange and black Heliconius, but I like the way it looks on the orange slice. 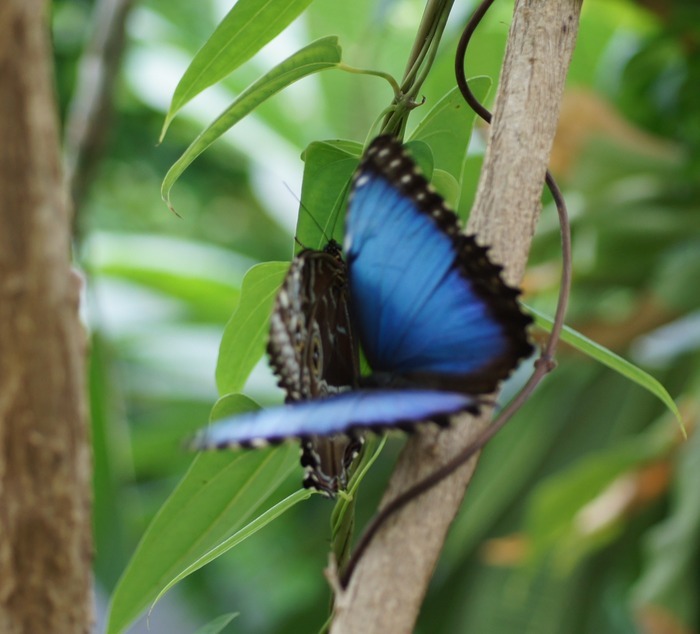 We think of butterflies as passively flittering from flower to flower, but the airborne blue morpho was divebombing the roosting one, clearly trying to get it to move. I don't know why it was so determined to dislodge the other one, but it spent a lot of time beating the other one with its wings. Really, though, being rudely slapped with a butterfly wing just isn't that big of a deal, and the other one did not budge. 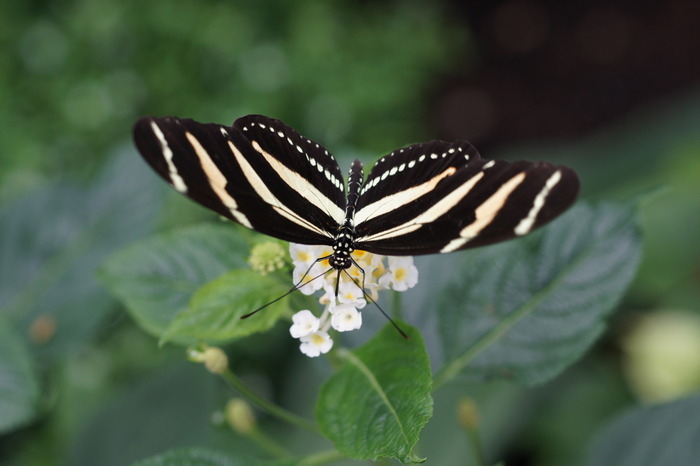 The Zebra Longwing, Heliconius charithonia or Heliconius peruvianus. The two species look identical, but it was recently discovered that they are genetically separate species. Eric finally had a butterfly land on him! Unfortunately it chose a rather awkward spot. After a remarkably long time it finally vacated Eric's crotch and landed on my shoulder. 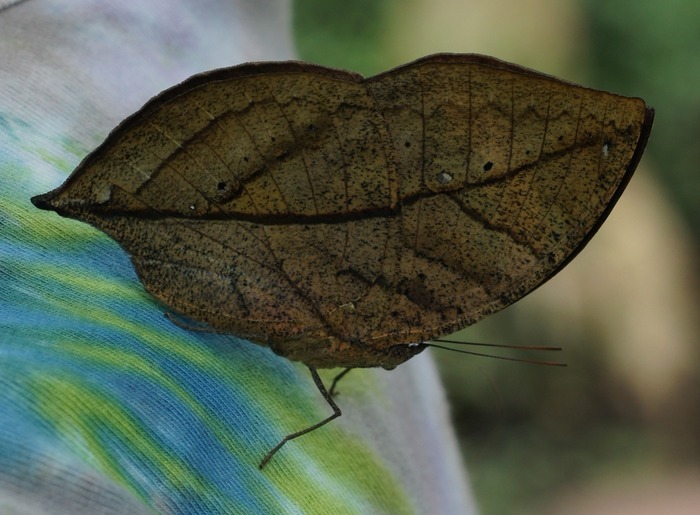 With its wings closed it does a very convincing leaf imitation. Wings open - I think this is another species of owl butterfly, although I can't match it to a specific name. 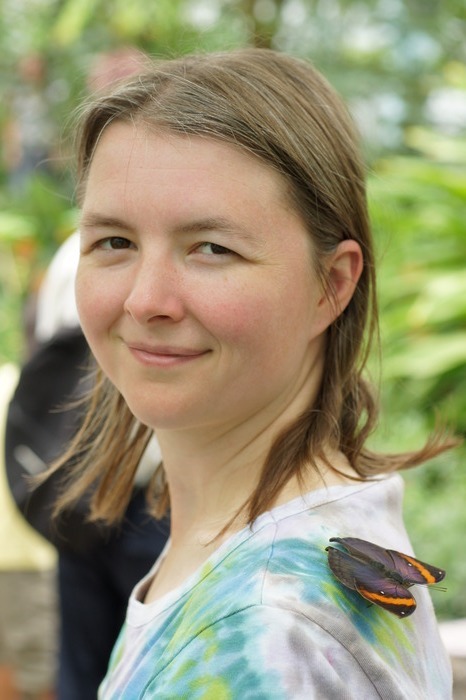 Portrait of me with our friendly butterfly. 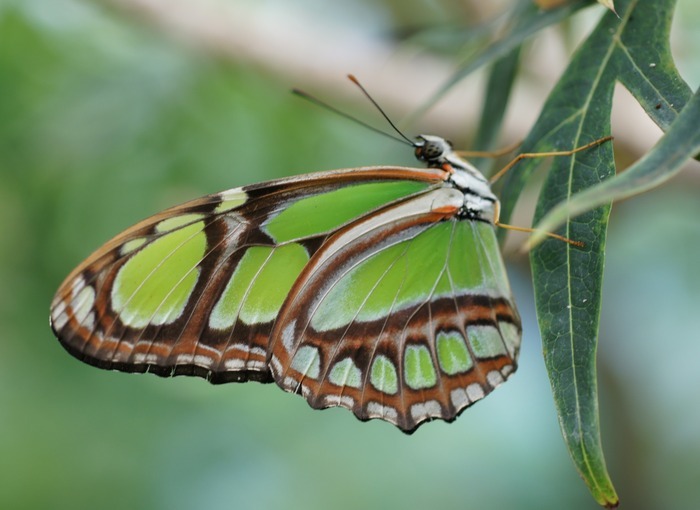 Malachite butterfly, Siproeta stelenes, from Central and South America. 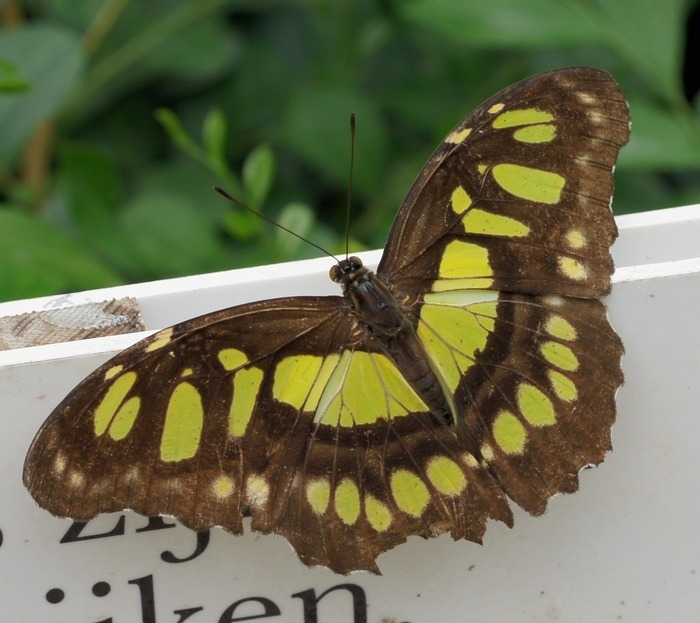 Same species with the wings closed. 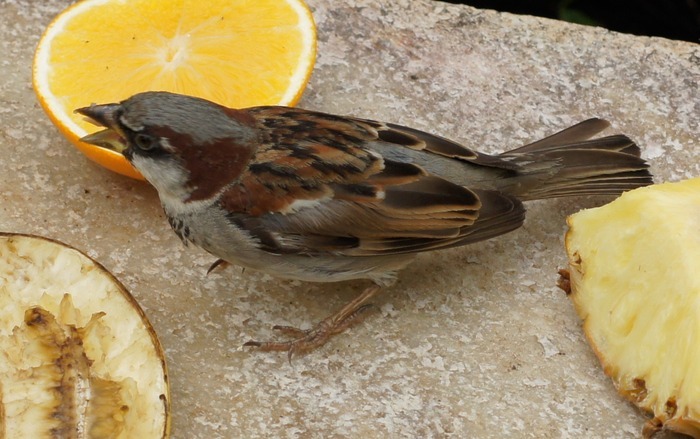 An avian guest in the garden - a house sparrow. 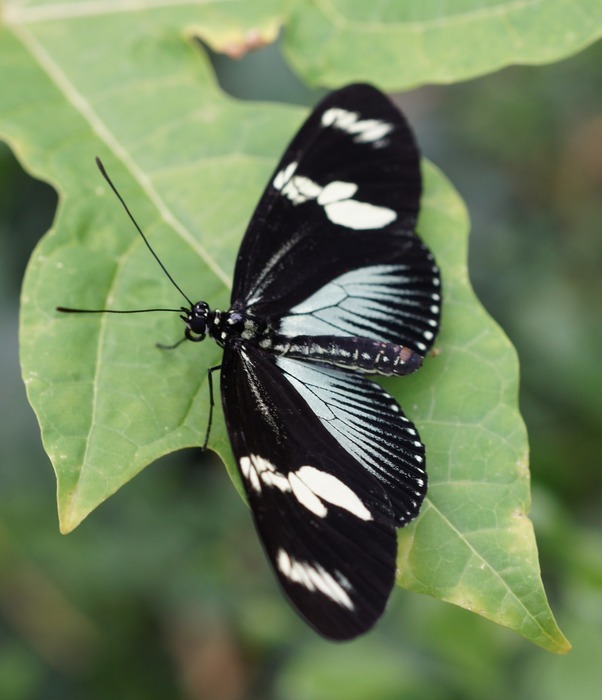 Possibly a blue form of Heliconius doris, or a Heliconius atthis with extra blue on its hind wings. 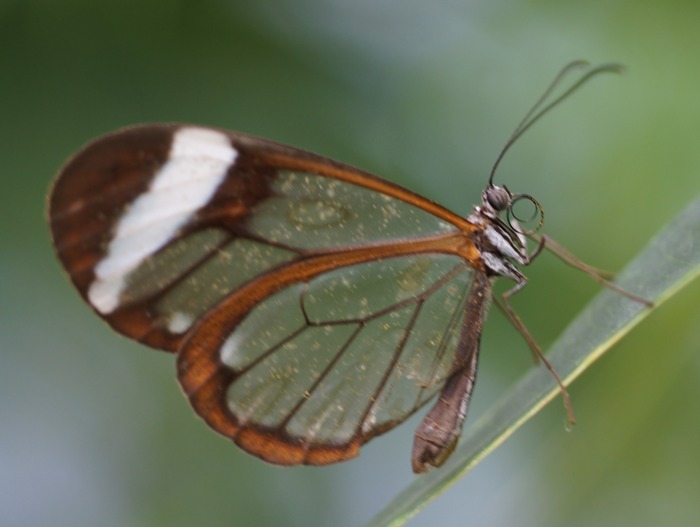 Greta oto, the glasswing butterfly. 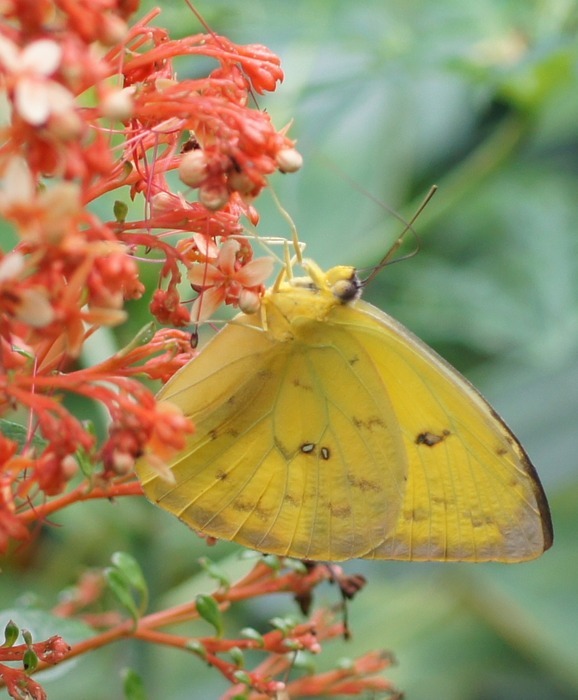 In addition to being nearly invisible, the males of the species drink the nectar of a toxic flower. 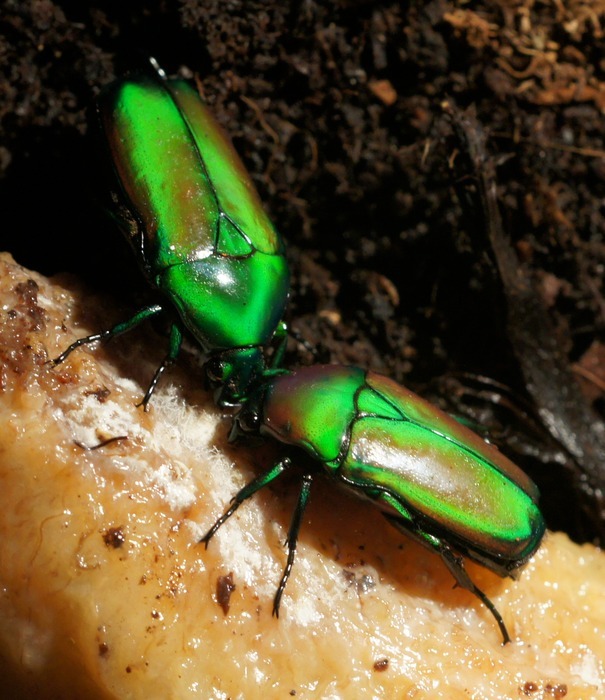 The toxin may deter predators and is used to make a pheramone to attract females. 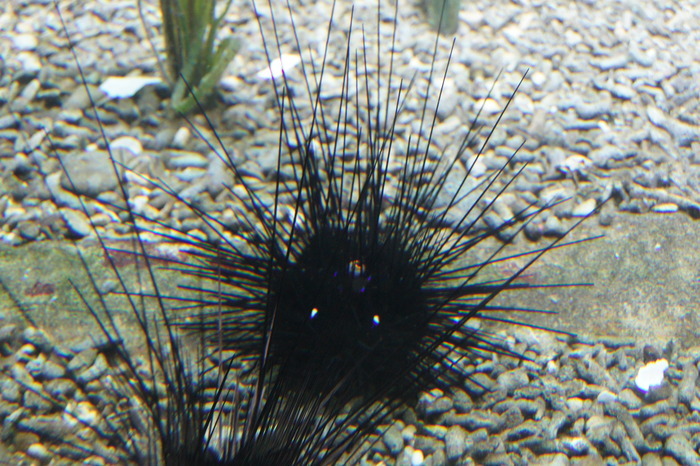 Sea urchins in the Artis aquarium. I had never noticed sea urchins having a ring of iridescent spots on them. They show up reasonably well in this photo, but I still don't know what they are. A mara with a group of alpacas. 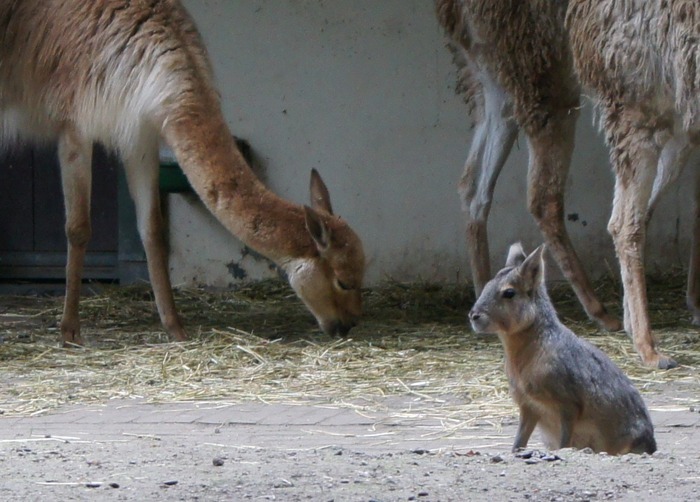 Maras are members of the rodent family which look and act much like rabbits, but are true rodents as opposed to Lagamorphs. Like guinea pigs, they are native to moutainous regions of southern South America. They may walk, hop, gallop, or bounce on all four feet. 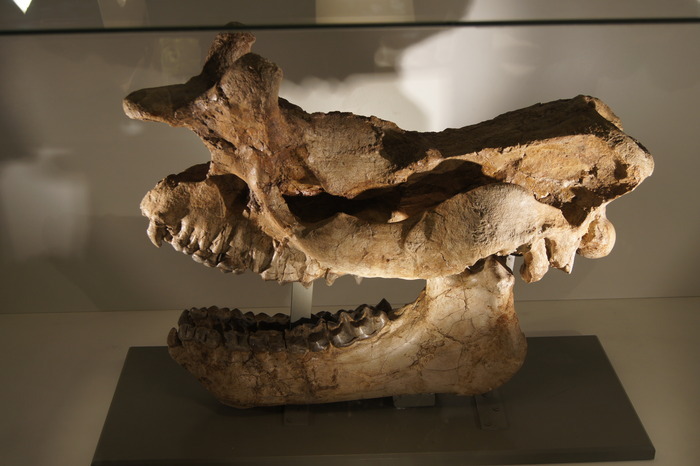 In the Artis geologic museum, the skull of a titanothere. Titanotheres belong to an extinct family of animals in the same group as horses and rhinoceroses. The first members of the family looked much like the first horse, Eohippus, but were stockier and had larger feet. Roughly 25 million years later, some of its descendants had become 2.5 meters tall with two blunt horns on its snout. It is not known exactly how the horns were used, although rib fractures in fossils of males suggest that they used the horns to fight. 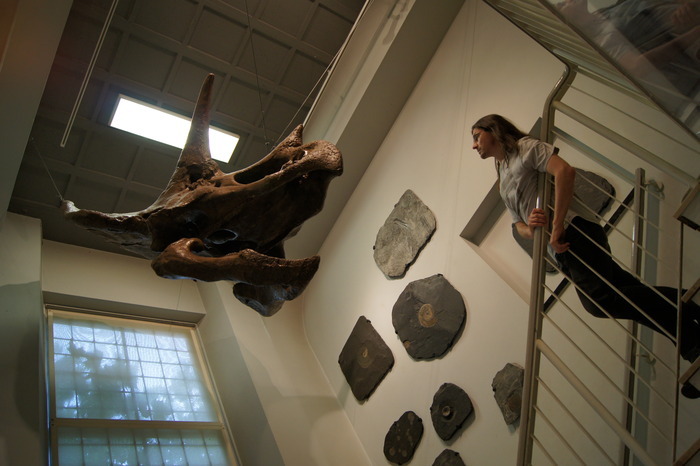 Eric studies the skull of a triceratops. 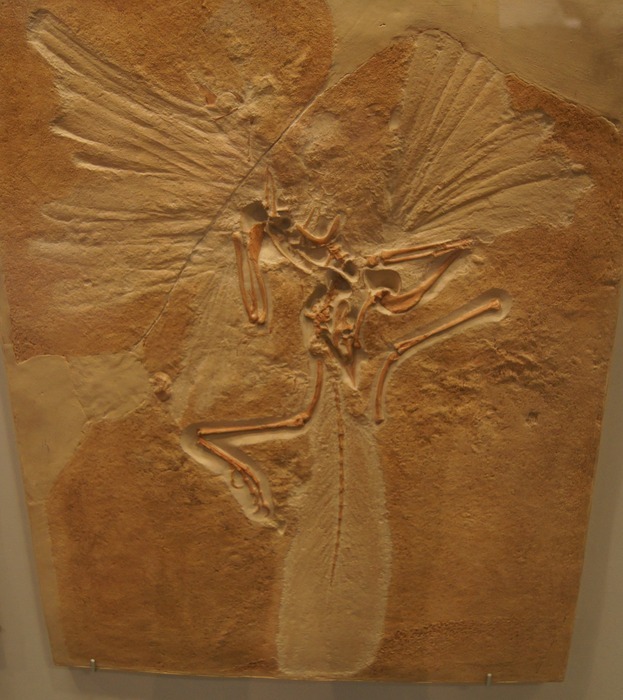 A copy of one of eleven fossils of Archaeopteryx, the first bird. The original is in the British Museum. Like modern birds, Archaeopteryx has flight feathers, fused clavicles (a wishbone ), and the beginnings of opposing toes on its feet (a feature which allows birds to easily perch). However, it has teeth, a long bony tail, and claws on its forelimbs that closely resemble the theropod dinosaurs. Some of the later theropods, in turn, had feathers. (There is even some suggestion that young Tyrannosaurs may have had feathers, which creates a pretty amusing picture. Just don't laugh when one is looking.) Theropods were predators that ran after their prey, so many of the adaptations which help birds in flight also helped the theropods to run faster. It is thought that the therapods may have first grown feathers for display to attract mates.